We were getting very familiar with packing up and unpacking the rig by now. I was slowly learning how to spread out the stuff in the pantry to minimize shifting as we flew down the highway. We had begun to try not to be the first one who needed anything in the cabinets. I had secretly been making bets on how many items would hit your toes upon the first opening after a move. It was really unfair my being the mom in this situation as I was the one having to go into the cabinets for dinner components, but this was just part of life on the road; one of the negatives to compare to the long list of positives. This being the third time we had trekked across the state of South Dakota on I 90, we knew what to expect and how long this journey would take. It was still grueling pushing Ol’ Blue up those rolling hills at a measly 35mph. The lil one and I had taken all the pictures you could take on this stretch of open highway. We had played our ABC road sign game until all the letters were running together before our eyes. 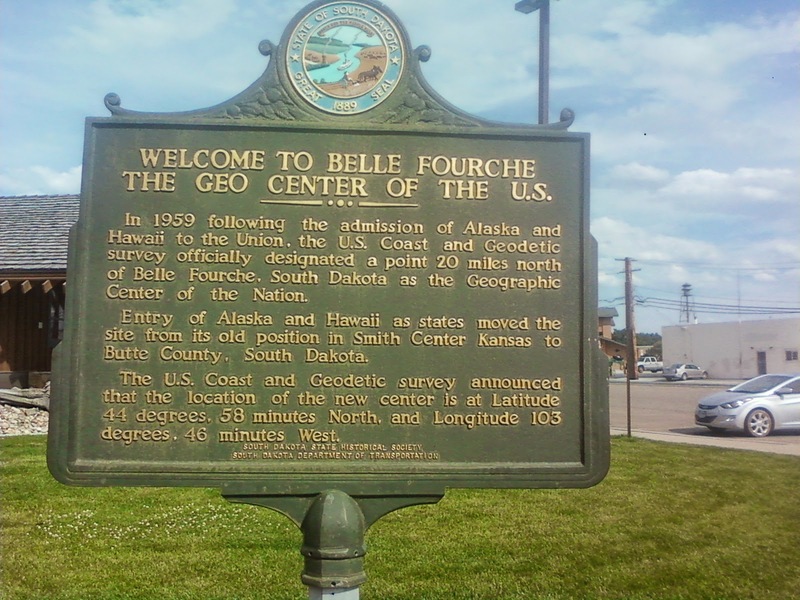 We had decided to stay in a smaller town this time; Belle Fourche, about 1hr north of Rapid City, closer to the job. Wyatt’s Hideaway Campground was the one we decided on, mainly because they had a creek running through it. It was still a few weeks before Sturgis hit town so the rent was still reasonably cheap. 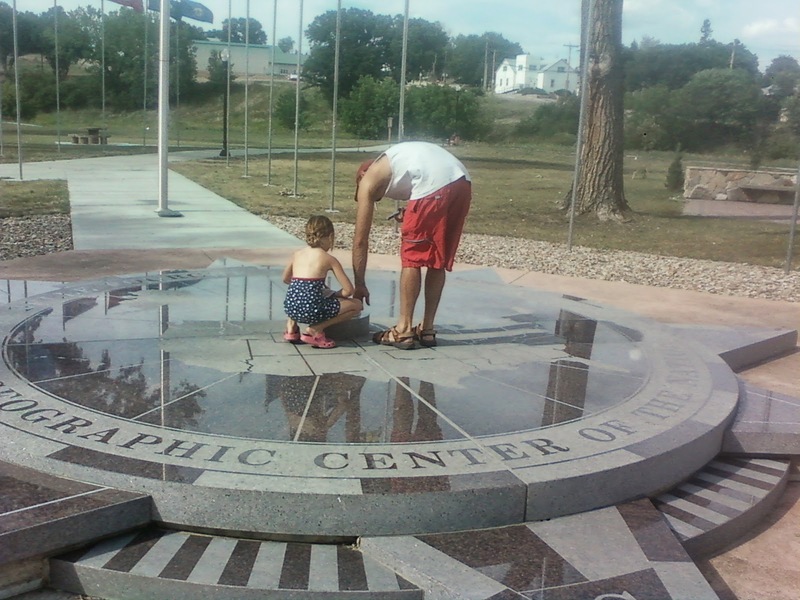 This just happened to be the geographical center of the USA, including Hawaii and Alaska. 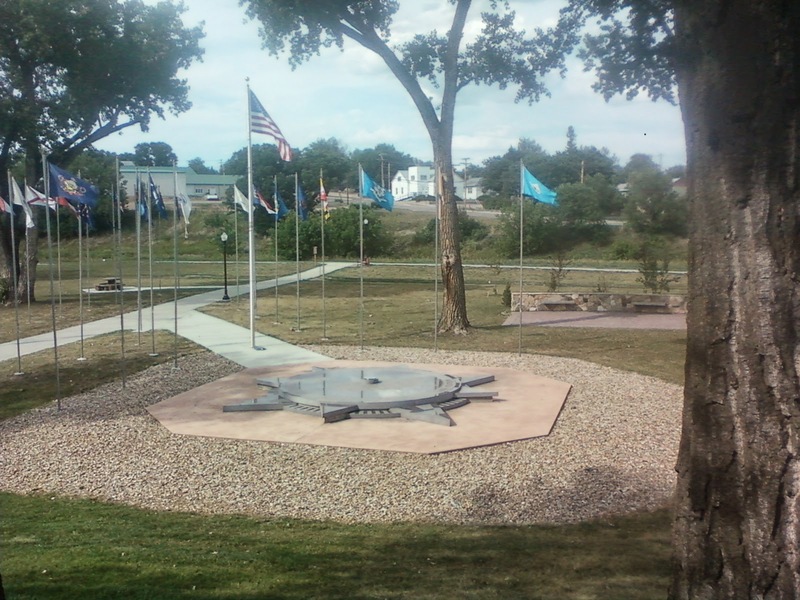 The story goes that the center is actually located 30 miles north of the monument on a farmer’s land. He got tired of tourist coming by and disturbing his sheep so they voted and decided to move the landmark to town to visit and view; the sheep and farmer lived happily ever after in history and peace and quiet. 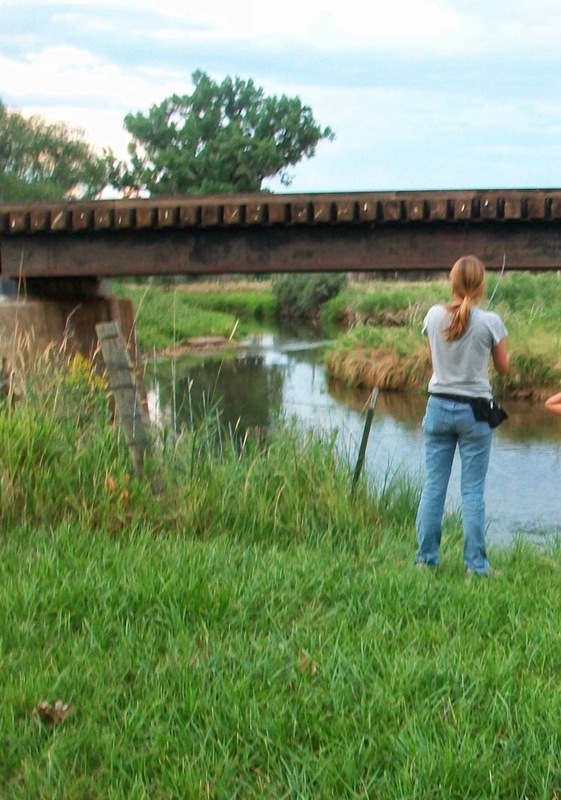 One of my favorite past times here was fishing in the creek for trout. 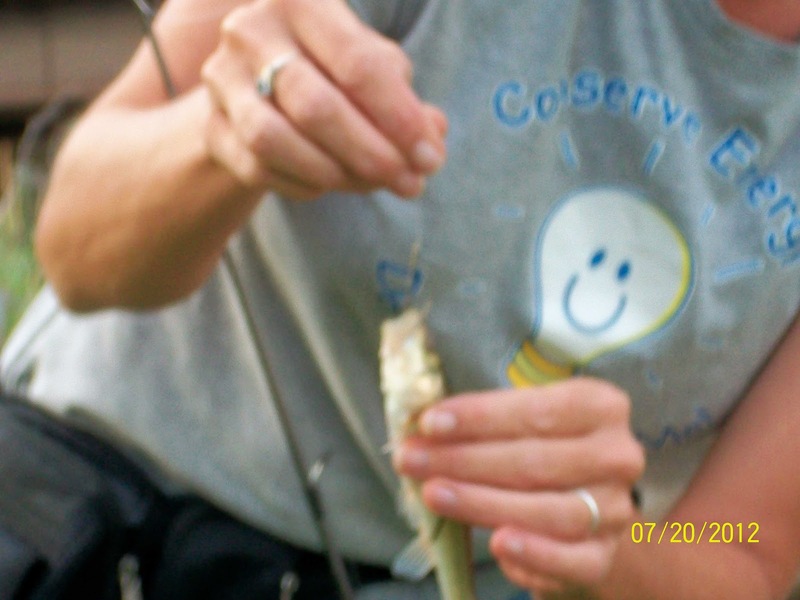 Sadly, I only caught a few fingerlings that weren’t big enough to eat. We let them live another day to grow bigger for the next fisherman. The lil one and lab had a ton of fun playing in the knee deep creek on those hot summer days. There was no fear of gators in these fresh waters, it was bone chilling cold. We had made very good friends while here previously, they too became adopted family. We celebrated one of their girl’s birthdays during these few short weeks. While having issues collecting our pay from the job, we all bonded together over simple things like how to feed our family with no money. We had found ourselves in the same boat as all of our husbands had worked for the same guy who refused to pay them. The owners of the RV Park worked with us on the rent and understood our situation. One evening the husband brought over a bag of frozen chicken and fresh veggies from their garden; we ate like kings that night. Eventually everything worked itself out, like it usually does. The guy finally paid us most of what he owed, I think us harassing him had something to do with it too. A friend’s mom wanted us to come down to KS and do some work on her house. After a few phone calls and counting our pennies, we decided to head that way. We would put off ND for a while longer. Our choices here were to head south and do residential work or to head north to the oil rigs; we decided the oil rigs would still be there, besides she couldn’t find anybody else to do the work. Winter was coming on soon and she needed it done before then. The decision was made and away we went on the next leg of this journey we call life, to Atlanta, KS.